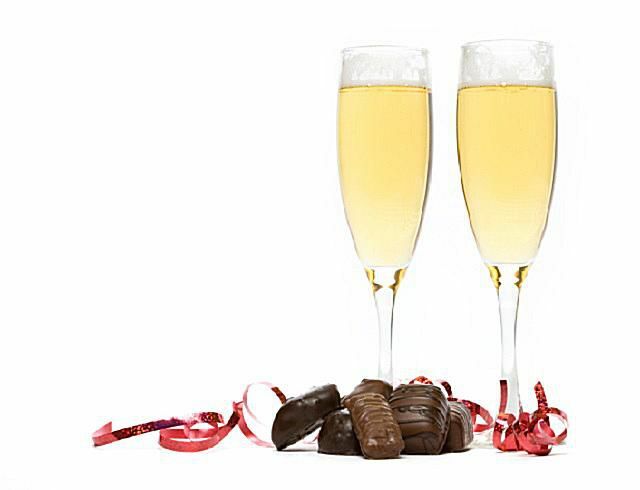 Pairing Champagne and sparkling wine with chocolate is tricky business. The typical, dry-styled bubbly can wreak absolute havoc on the sweet, fatty profile of white and milk chocolate and take the tannins in dark chocolate to extremely bitter ends. To handle chocolate with bubbles, go for something sweet and perhaps pink. Look for Champagne terms such as "demi-sec" or "doux" on the label, both referring to sweeter treats. A top pick for demi-sec Champagne is Laurent-Perrier Demi-Sec Champagne. For true pink Champagne, opt for a non-vintage Nicolas Feuillatte D'Luscious Demi-Sec Rose. If you are shooting for bubbles and not limited to only Champagne (the highly regarded sparkling wine from Champagne, France), then save a few pennies and shoot for sparkling wines from California or Italy to Spain and other French-based regions (dubbed "Cremant" locally). Consider the sweet red themes of Italy's Banfi Rosa Regale for combining the elements of higher residual sugar and ripe red fruit with white, milk and dark chocolate options. Opt for "pink" bubbly and milk chocolate-covered strawberries to marry the red-fruited virtues of a rosé sparkling wine with the innate sweet profile of chocolate and strawberry combo. While chocolate is not always considered a go-to pairing for most wine finds, there are plenty of bottles that marry extraordinarily well with all things chocolate. From the creamy, cocoa-butter base of white chocolate to the tighter tannins and bold flavors of dark chocolate, finding a wine to match the chocolate’s textures, flavors and profiles can take a little footwork but is well worth the effort. The subtle, creamy character of white chocolate calls for a wine that shows a light to medium body. Moscato d’ Asti is a top pick pairing for white chocolate, thanks in part to its delicate body and bubbles, which work wonders on the cocoa butter content and sweet essences of the chocolate itself. Late harvest Rieslings with their lower alcohol levels and higher sugar contents also make a remarkable match to white chocolate themes. Milk chocolate is by far the more versatile chocolate option for pairing with wine. Running the gamut from white wine finds like Moscato to Gewurztraminer and marrying up with the likes of Pinot Noir and Zinfandel, or shooting to fortified favorites like PX Sherry, Port and Madeira, milk chocolate holds higher sugar levels and lower tannins than its dark chocolate cousins making it easier to access with a wider range of wines. Chocolate themed desserts often fall in line with milk chocolate pairings. German Chocolate cake caters remarkably well to a fruit-driven Australian Shiraz, a variety of Port wines and the sweeter side of Banyuls. Chocolate-dipped strawberries show best with Moscato d’Asti and an Italian sparkling rosé or red wine like Banfi Regale Rosa or Brachetto d’Acqui. The latest rage of chocolate with sea salt is made for everything from light to medium bodied dry reds (where the salt will serve to soften the tannins) to Ruby or Tawny Ports. Have a need to pair caramel and chocolate themes? Then opt for cream Sherries or sweet sparkling wines, both carry the caramel well but in different veins – the cream sherry is complementary in style and the sweet sparkling wine shows a delicious palate contrast. The dry tannin profile of a bittersweet 70% or higher dark chocolate partners remarkably well with the sweet, almost sticky profiles of a bottle of Banyuls from the Languedoc Region of southern France. Or consider a late harvest Zinfandel, along with the heady fortified wines like Malmsey Madeira or a Tawny Port; all add weight and residual sugar levels to carry the dry style of the chocolate. Prefer a dry wine to cater to dark chocolate? Opt for reds with a fruit-forward style that can mask as sweet on the palate. Pinot Noir, Merlot, and Zinfandel are favorites as the tannins in the wine cancel the tannins in the chocolate and allow the pure fruit to shine through. The best wine and chocolate pairings elevate both the chocolate and the wine. When a pairing is off, it tastes bitter, especially with chocolate. To maximize this unique pairing, always start with a wine that is sweeter than the chocolate and similar in palate weight, with lighter styles of chocolate partnering with wines that carry a more delicate body profile. The sweet factor of both the wine and the chocolate plays a major role in the success of the pairing. Typically, you want to shoot for a wine that is sweeter than the chocolate you are pairing it with. Consider the weight of the wine and the weight of the chocolate. For lighter styles of white and milk chocolate, the lighter to medium bodied wines will show a brighter pairing than a wine that is heavier on the palate and over competes with the chocolate. The weight of the wine also plays a role in the order of pairings. If you intend to run through a lineup of wine and chocolate pairings, then make sure to start with the lighter chocolates and wines first, saving the heavy-hitters until the end, so that they do not dominate the more delicate styles.